The author defines a super food as a food that contains multiple micronutrients and phytonutrients that provide health benefits. The author defines a "super meal" as a combination of super foods that help to prevent disease or heal the body from disease. The author has grouped these super foods into five categories of “live” super foods. When consumed on a regular basis as part of a balanced synergistic meal, these foods create a biochemical/hormonal balance that reduces insulin production, controls appetite, nourishes the cells, strengthens the immune system, prevents inflammation, and helps to heal the body physically, biochemically, hormonally, emotionally and spiritually. As a result, these foods help to reverse your diabetes. The list of five “live” super foods includes vegetables/(some) fruits, filtered water, lean protein, monounsaturated fats/Omega-3 fats, and some organic whole grains -- but, does not include many of your favorite "dead" foods or any of the so-called “healthy” foods. However, if you're diabetic or struggling with some similar disease, then, you must consume these foods (and, avoid the 5 "dead" processed foods) as part of the Super Meal Model Diet for Diabetics -- to ensure that your body is obtaining a balance of key macronutrients, micronutrients, and phytochemicals. Author's Sidebar: The terms "live" and "dead" may sound a little melodramatic, but I believe that they get the point across without having to explain the rationale of each term in detail. In addition, I found these terms to be very effective in making specific points during my lectures and workshops. Also, these terms tie nicely into the book’s title and the photograph on the front cover of the book. “Live” food (pronounced l i v e as in "I'm alive") helps the body to heal, fight disease and stay alive. “Live” foods are primarily raw, unprocessed, lightly-cooked or partially processed foods that contain most of the seven nutrient factors. The term “live” does not necessarily mean that the food is alive, but it does contain the nutrients that keep the body alive. Coincidentally, these foods are connected with the prevention and reversal of many of the major systemic diseases and ailments. “Dead” food inhibits the body from healing and leads to disease and early death. “Dead” food is man-made, processed food that lacks most of the seven nutrient factors. Coincidentally, these foods, along with a sedentary lifestyle, are connected with the development of many of the major systemic diseases such as heart disease, diabetes and cancer. For those familiar with proper nutrition, there should be no surprises with the following list. 1. Vegetables, Some Fruits, Other Plants: include bright-colored, tasty foods that are full of critical macro and micro-nutrients. Vegetables include green/leafy and bright-colored, such as spinach, broccoli, Brussel sprouts, bok choi, greens (collards, mustard, kale), Romaine lettuce; asparagus, cabbage, cauliflower, celery, cucumbers, kelp, stringbeans; beans, carrots, onions, garlic, okra, peppers (orange, red, yellow, green), squash; sea vegetables; and, legumes. Fruits include dark, bright colored fruits such as açai berries, blackberries, blueberries, cherries, cranberries, elderberries, strawberries, apples, grapes, pears, goji berries; plus, kiwi, lemons, limes, mangosteens, and pomegranates. 2. Filtered water: comes from whole raw vegetables and fruits, raw juices, grasses, and tap water that has been filtered. Most tap water contains contaminants including bacteria, viruses, parasites, dissolved metals, pesticides, herbicides, waste, lead, asbestos fibers, fluoride, chlorine, and other chemicals. 3. 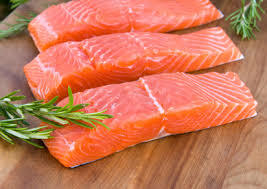 Lean protein: includes fish (wild salmon, sardines, tuna, mackerel, tilapia), nuts, seeds, beans, lentils, whey protein, whole soy foods (tofu, tempeh, miso); lean, organic beef, free-range chicken breast without the skin, turkey breast without the skin; goat’s milk, raw milk, low fat plain yogurt; organic eggs, low fat cheese, soy/tofu cheeses, blue-green algae (spirulina, chlorella); grains (amaranth, quinoa); wild game (venison, bear, bison); organic seafood (shrimp, crab, lobster); and most vegetables. 4. Unsaturated fats: include monounsaturated fat, Omega-3 polyunsaturated fat, some Omega-6 polyunsaturated fat, and certain saturated fats. Monounsaturated fat is contained in extra virgin olive oil, macadamia nuts, cashews, avocados, peanuts, walnuts, and almonds. Omega-3 fats are found in cold-water fish such as wild salmon and sardines; and, nuts such as walnuts and almonds. 5. Organic whole grains: include amaranth, quinoa, kamut, barley, oat, rice germ/bran, and alfalfa. However, most diabetics should avoid grain, at least until they stabilize their blood glucose levels and reach Stage 4 of the Death to Diabetes Program. 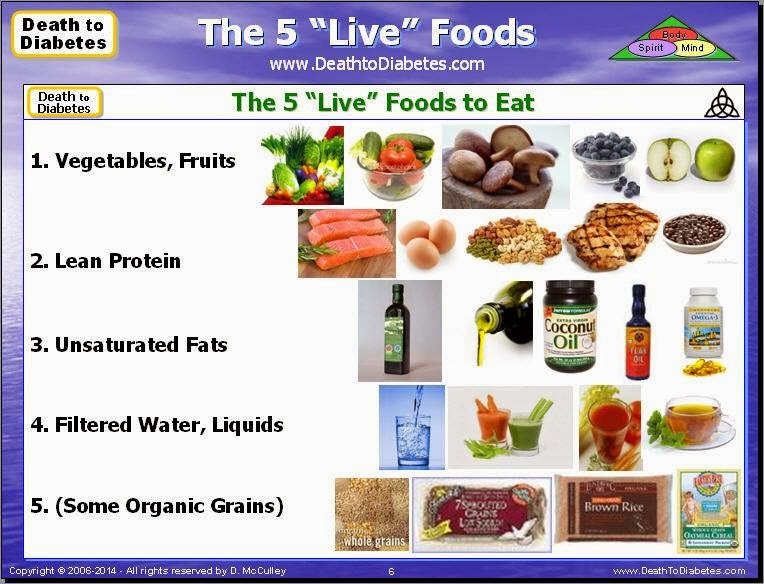 Note: For a complete list of "live" foods (and "dead" foods), refer to Chapters 5, 6 and 7 of the Death to Diabetes book.